I am happy to report that Dylan was a good boy for his grandparents again yesterday when they watched him. I don't know why he is only half good when he's with me but I'd rather he ease up his mean ways on others because the parent should bear the greater burden of attitude problems from their kin. But not only did my mother-in-law watch Dylan for me yesterday....she also cleaned my house. She is an amazing person, I mean, who does that? She's already taking time out of her day to watch Dylan but then she cleans my house too? She's an angel. Last night Zepeda was editing pictures from our Vegas birthday trip and one of the pictures stood out from the rest. My grandparents (Oma & Opa) moved to Vegas about six years ago and we rarely get to see them because of it. The day I went into labor with Dylan my mom got them tickets to fly out and see the baby but they missed their flight because Opa passed out in a grocery store which landed him in the hospital. 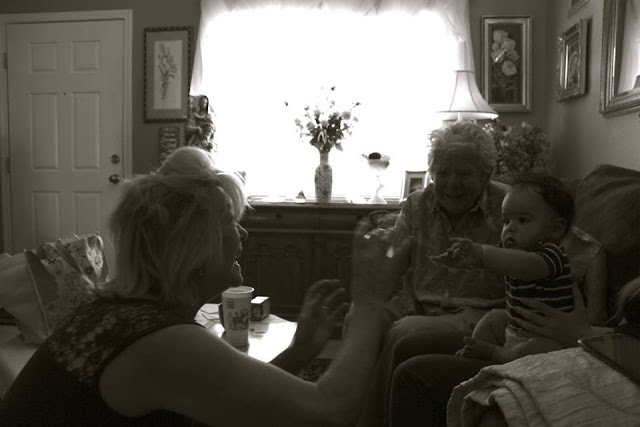 We knew during this Vegas trip we wanted to pay Oma and Opa a visit and introduce them to baby Dylan, which we did. They loved him (of course) and it brought me great joy to see them with my son. It was a full circle moment that I will treasure forever. I only wish that they lived closer and I were able to see them more often. Though to be honest I wouldn't mind going to Vegas again sometime soon.